We’ve been in a holding pattern all these months since the last update, just living life and hoping to get a call from a social worker saying that we’re being considered as a match for a child. Something like that call came, but it was from a friend rather than a social worker. In early October, I got a Facebook message from a friend who remembered that we are hoping to adopt through foster care. A friend of hers had just posted a Facebook note saying that a family member was about to terminate her parental rights to two children who are currently in foster care in our state, freeing them to become eligible for adoption. No one in their extended family was in a position to adopt them, so she put the word out about the kids in the hopes that someone willing to help them maintain connections to their birth family would be interested. I connected with the family member through our mutual friend and over the course of a few days, had several email exchanges and phone conversations about the children. The primary thing that stood out over these talks is how very much their family cares for these kids. I can’t even imagine taking the time to talk with almost-strangers about difficult family issues, just days before possibly never getting to see those children again. The kids–like all of us–have some challenges, but luckily those challenges are not being unloved or unwanted. Due to the last-minute timing of our connecting with the family, we’re not able to circumvent any of the (many) US foster care hurdles to adoption. Although I’ve spoken with the kids’ foster care case manager several times and seem to be on good terms with them, technically we’re seen as the same as anyone submitting our home study documents for consideration with the children. The case manager reminded us that this is a very long process, and we should keep our options open and not get too attached to the idea of these kids. Oh, we know, Case Manager. We know. But despite the high failure rate for this kind of thing, we’re hopeful that being a known quantity with the kids’ social worker and having their birth family’s seal of approval will mean we get (at least) a second look. Also, the way this whole connection came about feels so much better than anything we’ve experienced in the past. It’s just people coming together to help kids rather than a random couple applying online to be connected to a child who is known by their number in the great big foster care system. Ok. Maybe we won’t serve the mashed potatoes this way. Oh, and happy National Adoption Month! Check out 30 Adoption Portraits in 30 Days to read about adoption from many different perspectives. Fingers crossed indeed! I hope it works out this time… I’ll be thinking of you. 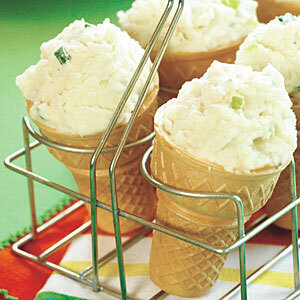 And I also hope you never serve mashed taters in ice cream cones. Just seems like an insult to both ice cream and mashed potatoes.